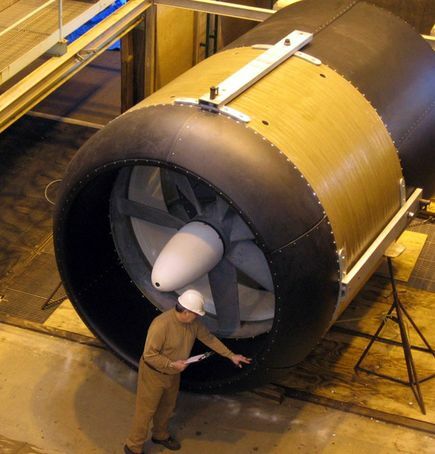 A full-scale SmarTurbine prototype was built in 2010 with a 3 m diameter, 4.5 m length, 2.25 m rotor, 7 blades (2:1 tip speed ratio), and each weighing 3039 kg. The turbine was installed on a research surface platform that included instrumentation to allow the research team to evaluate performance by monitoring metrics such as stream velocity, electrical current, and voltage. The dock was hosted by the Dow Chemical Company and located in the Mississippi River at Plaquemine, Louisiana. The target flow was 2.25 m/s for 75% of the time at Scotlandville Bend. Free Flow planned to install over 1000 MW of turbines across 53 permitted sites, with commercial arrays of around 120 turbines per site, with various riverbed pilings proposed. The test took place on the Mississippi River, near Baton Rouge, Louisiana. Free Flow Power was founded in 2007, and conducted general research for a few years. In 2008, a proof of concept 1.4-meter turbine underwent flume tests that generated 10 kW in 3 m/s flow. In 2009, the 1.4-meter turbine was tested with a river deployment, which secured a $1.4 million grant from the US Department of Energy. In 2010, the 3-meter turbine was constructed and underwent flume tests that generated 40 kW in 3 m/s flow, while also testing fish survivability from collision. This same turbine was then installed on a barge in the Mississippi River on June 20th, 2011 and performed 6 months of trials. The results were encouraging, as the device performed as expected, with no discernible harm to river-dwelling fish. A major drought experienced during 2012 produced record low-water conditions on parts of the Mississippi River, threatening commercial navigation on segments of the waterway and introducing conditions that affected the feasibility of turbine infrastructure locations that FFP had proposed at some of its hydrokinetic development sites. In conjunction with economic pressures in the electricity market, Free Flow Power conducted a feasibility evaluation and determined the sites were not feasible, resulting in a surrender of preliminary permits. Of the 53 proposed projects, there were 5 “Lead Projects” that are using the Integrated Licensing Process (ILP) and the remaining 48 sites were approved to use the Traditional Licensing Process (TLP). A series of 10 scoping meetings for the Lead Projects were held in April and May 2009, in Vicksburg, MS; New Orleans and Baton Rouge, LA; Memphis, TN; and St. Louis, MO; and written comments have been received. In September and October 2009, Free Flow Power hosted four two-day meetings to discuss its Proposed Study Plan for the Lead Projects. Following those meetings, filing of written comments from stakeholders, Free Flow Power’s filing of a Revised Study Plan, and additional written comments, FERC issued a Study Determination on January 27, 2010. The study determination approved Free Flow Power’s proposed studies with substantial modifications, including requiring test deployments of mock or prototype turbines. The U.S. Fish and Wildlife Service disputed aspects of the fish entrainment and related studies. The dispute resolution panel findings were filed on April 5, 2010. Limitations at the test flumes led to further discussions of study approaches for fish entrainment mortality study approaches. Free Flow Power hosted a meeting at which FWS, FERC, and other agency staff discussed these issues. The U.S. Army Corps of Engineers (Corps) had 4(e) mandatory conditioning authority for the navigation aspects of the project related to their responsibilities under the River and Harbors Act as carried out through the Federal Power Act. Preliminary permits were officially surrendered on June 28, 2013. Among the environmental issues Commission staff anticipates analyzing in its EIS are the potential effects of the proposed projects on navigation, sediment deposition and dredging, recreation safety, fish strikes by turbines, avoidance of habitat near turbines by fish, threatened and endangered species, cultural and historic resources, wetlands, and terrestrial vegetation. Mississippi River Projects is located in United States of America. The following studies were conducted at all of the “lead project” sites. There was some variation by site. River samples collected by the USGS once a month at various locations along the Mississippi River. Created a baseline for further analysis. Fish entrainment, movement, behaviour, habitat use, and population effects estimation. Model the turbine with CFD techniques; determine the range of fish species in the area; assess risk. Nearfield and Farfield effects of energy removal. A combination of 2D and 3D numerical Computational Fluid Dynamics modelling. Maps of river velocities were created from model outputs. Quantify the existing seasonal, daily, and hourly navigation patterns. Turbine locations were mapped at a minimum distance of 45 feet below the Low Water Reference Plane, in order to give commercial ships ample draft clearance. Fish injected into the turbine to estimate mortality. Behavior and habitat use studies used to estimate likelihood of fish passing through turbine. Results combined to estimate annual mortality. Early entrainment tests show no harm – intended to investigate the appropriateness of the Conte Lab for entrainment testing resulted in no harm to 10 lake sturgeon injected into the turbine and observed for 48 hours though at least one fish died eventually. To place its potential EMF contribution in the context of the lead sites, FFP is required to qualitatively identify the sites estimated to be the highest and lowest in baseline, background EMF. They are to measure background levels at these two sites in the field and place their model predictions of their EMF contribution in this context. This approach replaced their proposal to address all aspects through modeling.